Generally accepted as one of Kendal's oldest surviving inns, if not the oldest, the Fleece is one of the most prominent survivors of our bygone pub history. According to local guide books and local historians, the date 1654 was found on a panel within the building, lending some tenuous support to the inn's age. It's also one of Kendal's few surviving timber framed buildings. Originally called the Golden Fleece, a reference to the symbol used by woolcombers guilds during annual guild processions, the inn was the starting point for the county of Westmorland's first stage coach service in 1772. Above. Ye Olde Fleece Inn, 2006. The Fleece inn is the only building along Strickland Gate that has retained its original jetted first floor, supported on five pillars. Old photos and postcards show many buildings with this sort of facade....all have been removed over the years. It seems that, due to the small number of letting rooms available in the past (only six) the Fleece was never really regarded as one of Kendal's main inns, even though it had stabling for 28 horses....a slight imbalance. 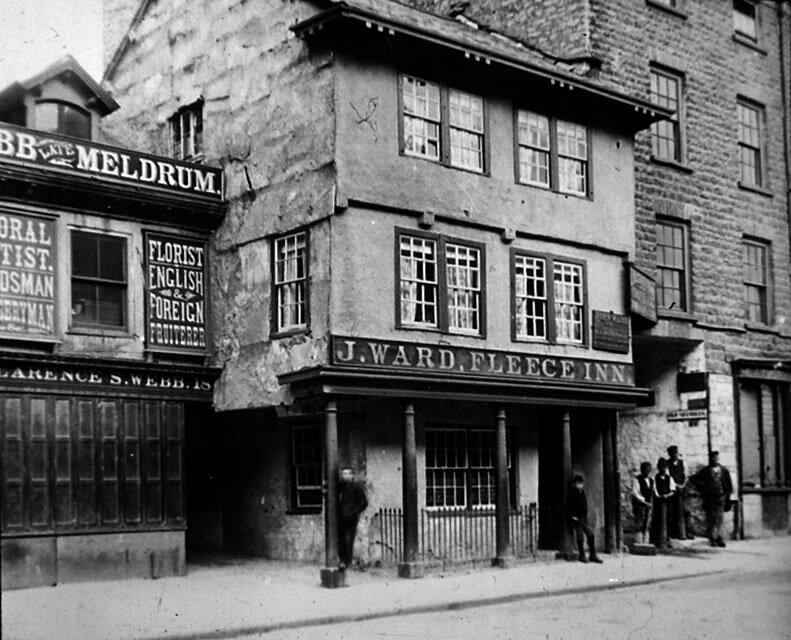 As well as the main building, the smaller building to the left of the Fleece, was originally part of the inn, as were a number of buildings to the rear. Most were used for storage of beer, coal and other goods. Above. Ye Olde Fleece Inn, 2007. In 1920, the inn was owned by the Westmorland Catering Company Ltd. 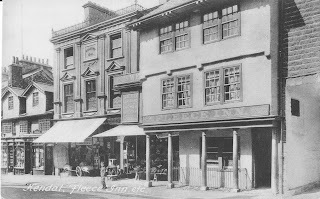 In 1934, Rowland Hoggarth, previously of the Shakespeare, was the Fleece's owner. He remained there from 1925 until 1934. He sold the inn for around £32,000. During his ownership, the inn's landlady was his wife Martha. 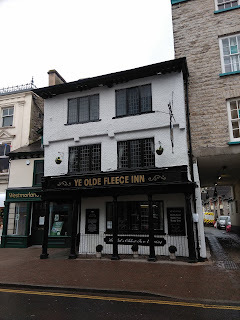 By 1930, the Fleece was owned by North British Trust Hotels Ltd. and it was during this period of ownership, that the Fleece probably became one of Kendal's most prominent drinking establishments. It was so popular, that the owners had trouble finding accommodation for the additional staff. Above. Ye Olde Fleece Inn's sign, 2017. By 1956, the Fleece was owned by local brewers, Collin Croft Brewery Co. Ltd. operating out of Collin Croft just off Beast Banks. The company was sold to Scottish Brewers Ltd. who later became Scottish and Newcastle some years later. Above. Ye Olde Fleece Inn, 2019, after extensive renovation. The inn's life during the 80s, 90s and 2000s has been a mixed bag of success, closure, renovation and reopening.....with its final incarnation appearing in February this year with a million pound rebuild resulting in the shiny new inn we see today. Fingers crossed the Fleece doesn't go the way of so many other town centre inns and pubs.